Midwest hair metal heroes Sgt. Roxx arose at the turn of 1990's. With big hair and hook laden and melodic arena rock sound, this five man crew turned more than a few heads around the Chicagoland area and beyond. There first EP, Push N Squeeze, has become something of urban legend for fans of the band and the era as it commands bids in the hundreds of dollars on eBay. 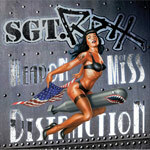 This archival collection on Weapon of Miss Destruction includes a remastering of the songs from the legendary EP along with recordings done in New York for Capital Records and two live recordings from Chicago venues. A quick listen to the remastered songs of Push N Squeeze demonstrates how Sgt. Roxx become a regional hit. They nailed the sound of the day with big hooks, swarthy riffs, and simple gut level swagger. In other words, songs like All You Need, Movin' On or the later Rockin' Horse and Alright show that Sgt. Roxx was the real deal, if only a little too late to the party. For a pure audio feel for the energy of that era, the live cuts are quite powerful. There's nothing overly inventive here: this is simply the solid melodic hard rock that made some bands of the day rich and famous, but also left many in obscurity. Would Sgt. Roxx have ever leaped beyond the Midwest to the mainstream and big time? The point is moot because they were already being subverted by grunge even as there success grew. Sgt. Roxx is a good band, and a great, yet conventional, representative of the end of an era. If head banging gonzo glam rock is your thing (or your history) and you don't want to shell out 400 bucks for the original works, then the archival collection Weapon of Miss Destruction will be right up your alley. Sgt. Roxx is a good band, and a great, yet conventional, representative of the end of an era. If head banging gonzo glam rock is your thing (or your history), then the archival collection Weapon of Miss Destruction will be right up your alley.